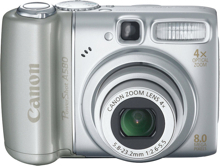 The Canon PowerShot A580 is an 8 megapixel point and shoot camera with a 4x optical zoom lens with Image Stabilization, a F2.6 maximum aperture, and a shutter speed range of 15-1/2,000 sec. It features a large high-resolution 2.5-in. LCD screen (115K dots).